We do a Games Based Learning MOOC tweetchat on Wednesday at 7 pm MT (Denver) when the Games MOOC is in session. It's sixty minutes of synchronous tweeting over twitter in 140 characters using the #gamemooc hashtag. To start, you'll need a twitter account. If you don't have one go to www.twitter.com and make one. Then go twubs http://twubs.com/ and log in with your twitter account. 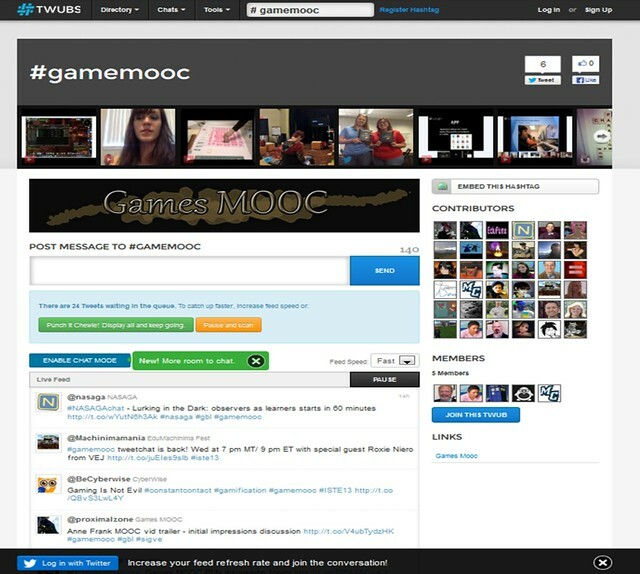 Type in "gamemooc" in the hastag box on the top of the page. The #gamemooc tweetchat lasts for 60 minutes. We start the tweetchat by asking you to introduce yourself - who you are and where you are geographically located. Since we are "connected educators", we then ask you to tell us what associations and organizations you are in. Then we do a few warmup questions (vocab quiz) so we are all using the same terms. After that we normally have 4- 5 discussion questions. We wrap-up at the end with last comments and ask everyone to re-introduce themselves. And yes - lurking is allowed!